On June 15, 1926, E. H. Hoge, Comptroller for the Berry Schools, wrote Mr. Maddox reminding him of the $250.00 installment payment due on July 1, 1926 on his fund subscription of $1000.00. The subscription was made during the recent $100,000 drive. Mr. Maddox's kindness in subscribing is appreciated. 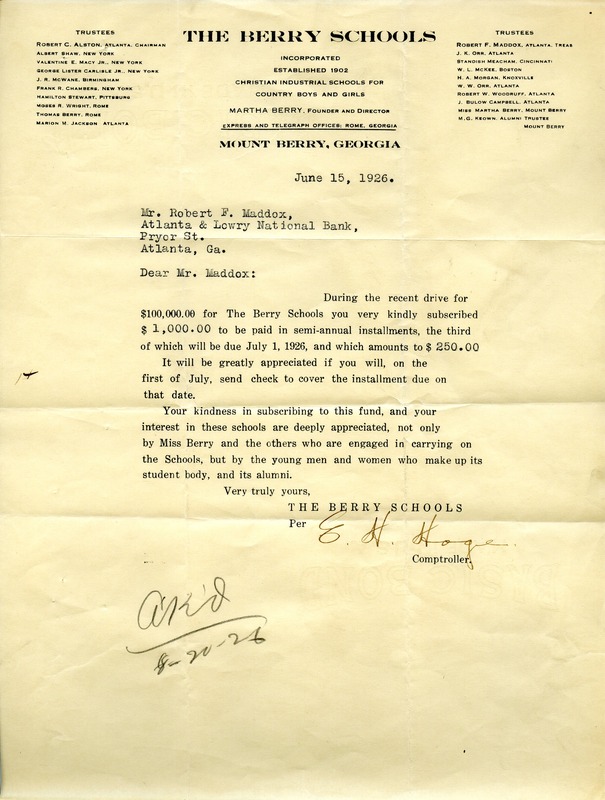 E. H. Hoge, “Letter to Robert F. Maddox from the Berry Schools.” Martha Berry Digital Archive. Eds. Schlitz, Stephanie A., Peggy Ratliff, et al. Mount Berry: Berry College, 2012. accessed April 21, 2019, https://mbda.berry.edu/items/show/2318.